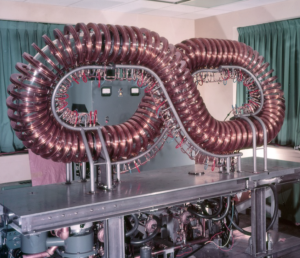 Dr. Lyman Spitzer invented the stellarator in 1951 and built several versions of this magnetic plasma confinement machine at Princeton University during the 1950s and 1960s, establishing the world famous Princeton Plasma Physics Laboratory (PPPL) in the process. 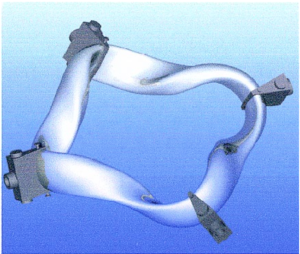 Dr. Spitzer’s earliest Stellarators were figure-eight devices as shown in the following photo. The next generation of stellarators adopted a simpler torus shape and created the twist in the magnetic confinement field with helical field coils outside the vacuum vessel. While stellarators achieved many important milestones in magnetic confinement, by the late 1960s, the attention of the fusion community was shifting toward a different type of magnetic confinement machine: the tokamak. Since then, this basic design concept has been employed in many of the world’s major fusion devices, including the Alcator-C Mod (MIT, USA), Doublet III-D (DIII-D at General Atomics, USA), Tokamak Fusion Test Reactor (TFTR at PPPL, USA), Joint European Torus (JET, UK), National Spherical Torus Experiment Upgrade (NSTX-U at PPPL, USA) and the International Thermonuclear Experimental Reactor (ITER, France). Now, almost 50 years later, there is significant renewed interest in stellarators. 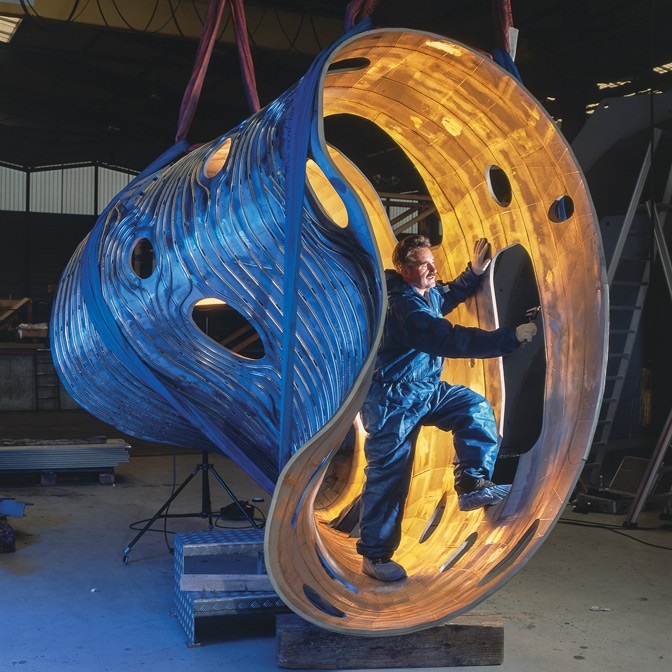 The newest device, the Wendelstein 7-X stellarator, became operational in 2016. It may help determine if modern technology has succeeded in making the stellarator a more promising path to fusion power than the tokamak. Modern tokamaks and stellarators both implement plasma confinement within a (more or less) toroidal vacuum vessel that operates at very high vacuum conditions, on the order of 10-7 torr. Both types of machines use the combined effects of two or more magnetic fields to create and control helical field lines (HFL) that enable plasma confinement and reduce particle drift in the circulating plasma. In the following description, the simple “classical” tokamak configuration shown below will be the point of reference. 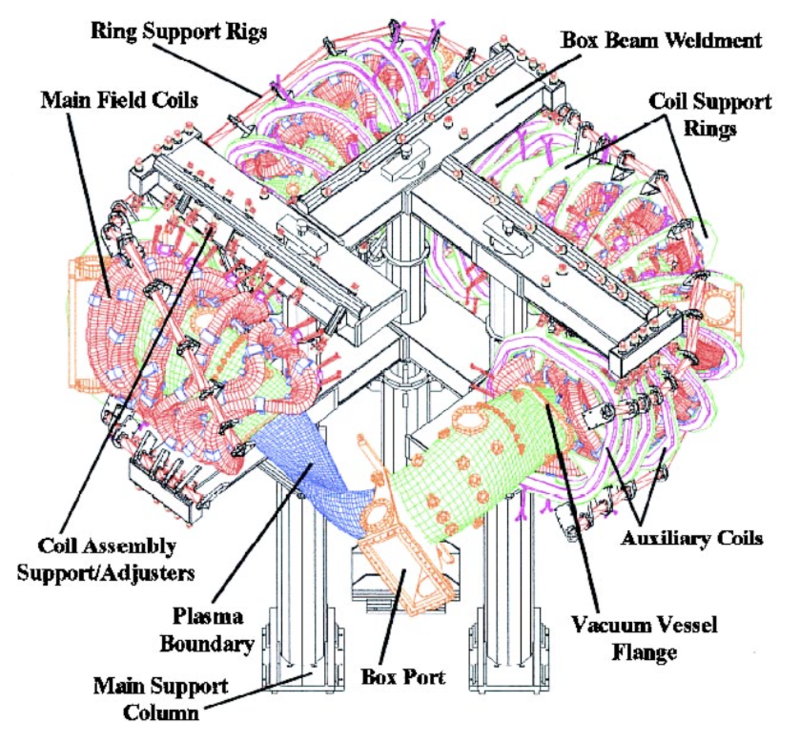 The main features of a tokamak are summarized below. 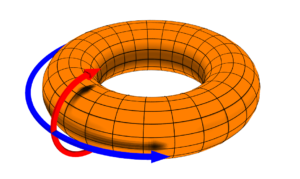 The vacuum vessel in a modern tokamak typically is an azimuthally-symmetric torus of revolution (donut-shaped), typically with a vertically elongated, D-shaped cross section. Modern “spherical” tokomaks maintain the D-shaped cross section, but minimize the diameter of the hole in the center of the torus. Plasma confinement within the vacuum vessel is accomplished by the combined effects of a toroidal magnetic field and an induced poloidal magnetic field. Together, these fields create the helical field lines for plasma confinement. 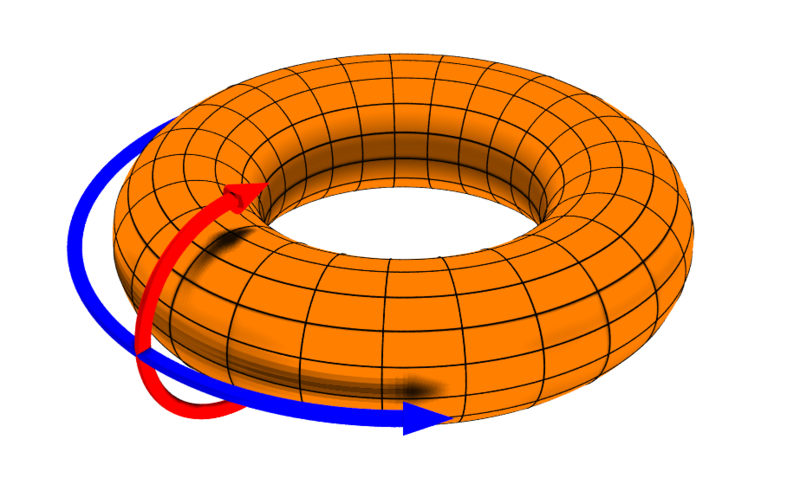 In the following diagram, the toroidal field is represented by the blue arrow and the poloidal field is represented by the red arrow. 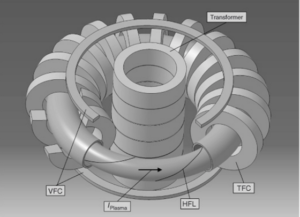 The toroidal field (blue) is generated by a set of external toroidal field coils (TFCs) that surround the vacuum vessel. The poloidal field (red) is generated by a strong induced plasma current (Iplasma), on the order of 106 amperes, flowing within the plasma inside the vacuum vessel. An external coil in the center of the tokamak serves as the primary coil of a transformer and the circulating plasma serves as the secondary coil of the transformer. To create the poloidal field, the transformer primary coil is charged at a controlled rate (i.e. to yield the desired rate of flux increase), thereby inducing a current in the plasma and heating the plasma by ohmic heating. When the primary coil reaches maximum flux, current is no longer induced in the plasma and the tokamak “pulse” is over. A pair of vertical field coils (VFC), one above and one below the plane of the torus, provide the ability to radially position the plasma within the vacuum vessel. Divertors inside the vacuum vessel define the maximum extent of the magnetically confined plasma, remove impurities from the edge of the plasma, and help minimize plasma-wall interactions. The high current in the plasma can falter unexpectedly, resulting in a “disruption”, which is a sudden losses of plasma confinement that can unleash magnetic forces powerful enough to damage the machine. 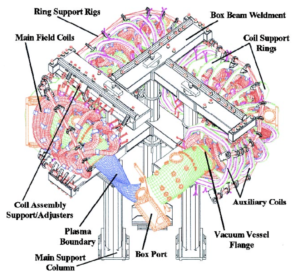 A tokamak is mechanically simpler than a stellarator. The physics characteristics of a tokamak typically yield better confinement capabilities than a stellarator. While the “pulse” in a modern tokamak can last several tens of minutes, a pulsed mode of operation may not be suitable for a commercial fusion reactor. Pulsed magnetic and thermal loads create mechanical fatigue issues that must be accommodated in the design of tokamak structures. The simple “classical” stellarator configuration shown below will be the point of reference for the following discussion. The main features of a stellarator are summarized below. There are many variants of devices called stellarators, with names such as Torsatron, Heliotron, Heliac, and Helias. All create the plasma confinement field with external magnet systems in various configurations and none depend on the existence of a toroidal plasma current. In the classical stellarator in the above diagram, the plasma confinement field is created by a set of planar (flat) TFCs and external pairs (1, 2 or 3) of twisting helical field coils (HFC) with opposite currents in each conductor in the pair. A stellarator is mechanically more complex and more difficult to manufacture than a tokamak. Stellarators may use a divertor or a simpler “limiter” to define the outer extent of the plasma. While a stellarator has no induced plasma current, other small currents, known as “pressure-driven” or “bootstrap” currents, exist. These small currents do not cause plasma disruptions as may occur in a tokamak, but complicate plasma confinement. A stellarator is intrinsically capable of steady-state operation. For a variety of reasons, a classical stellarator tends to lose energy at a higher rate than a tokamak. Advanced, modular stellarators are making progress in improving confinement performance. In the last two decades, dramatic improvements in computer power and 3-dimensional modeling capabilities have enabled researchers and designers to accurately model a stellarator’s complex magnetic fields, plasma behavior, and mechanical components (i.e., vacuum vessel, magnet systems and other structures). 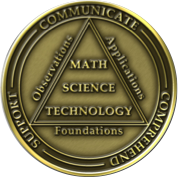 This has enabled implementation of a “plasma first” design process in which the initial design focus is on optimizing plasma equilibrium based on selected physics conditions. Key goals of this optimization process are to define plasma equilibrium conditions that reduce heat transport and particle loss from the plasma. As you might suspect, there are different technical bases for approaching the plasma optimization process. 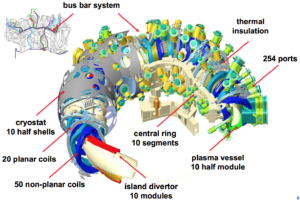 The stellarator’s magnet systems are designed to produce the confinement field needed for the specified, optimized plasma design. The physical layout and scale of the 7-AS machine is shown in the first diagram, below, with more details on the magnet system in the following diagram. 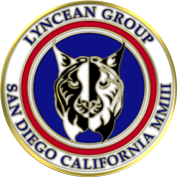 Demonstrated that the innovative modular magnet coil system can be manufactured to exacting specifications. Demonstrated improved plasma equilibrium and transport behavior because of the improved magnetic field structure. Confirmed the effectiveness of the optimization criteria. Demonstrated the effectiveness of a divertor on a stellarator (a common feature in tokamaks). Its successor is the Wendelstein 7-X. The physical arrangement of HSX is shown in the following diagram. 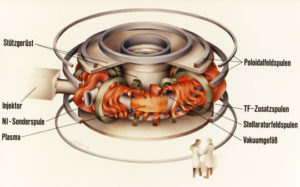 The HSX was the first stellarator to be optimized to deliver a “quasi-symmetric” magnetic field. While the magnetic field strength is usually a two-dimensional function on the magnetic surfaces traced out by the field lines, quasi-symmetry is achieved by making it one-dimensional in so-called “magnetic coordinates” (Boozer coordinates). Author Masayuki Yokoyama’s paper, “Quasi-symmetry Concepts in Helical Systems,” provides a description of quasi-symmetry. 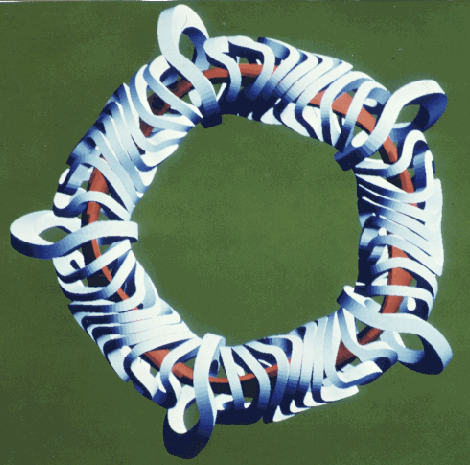 The HSX main magnetic field is generated by a set of 48 non-planar, modular coils, arranged in four field periods, yielding the twisting flux shape shown below. The 7-X is drift optimized for improved thermal and fast ion confinement by: (a) implementing quasi-symmetry to reduce transport losses, (b) minimizing plasma currents (Pfirsch-Schluter & bootstrap currents) to improve equilibrium, and (c) designing a large magnetic well in the plasma cross-section to avoid plasma pressure instabilities. After engineering tests, the first plasma was produced at 7-X on 10 December 2015. A November 2016 article in Nature summarized on the results of initial operation of 7-X. 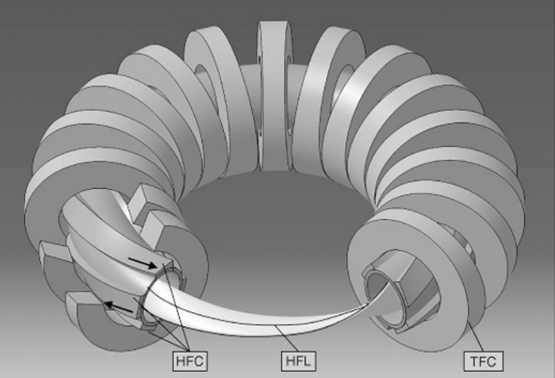 The article, entitled, “Confirmation of the topology of the Wendelstein 7-X magnetic field to better than 1:100,000,” confirmed that the 7-X is producing the intended confinement field. 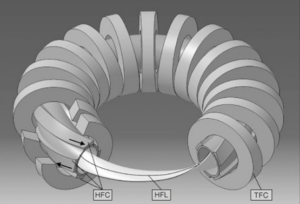 This article includes the following 3-D rendering and description of the complex magnetic coil sets that establish the twisting plasma confinement fields in the 7-X. The large scale of the 7-X vacuum vessel is even more apparent in the following photo. So the jury is still out on the ability of advanced stellarators to take the lead over tokamaks in the long, hard journey toward the goal of delivering usable power from a fusion machine. Hopefully, the advanced stellarators will move the fusion community closer to that goal. No doubt, we still have a very long way to go before fusion power becomes a reality.